For many of us, figuring out who we want to be when we grow up is an ever-changing list. But others have a calling much earlier in life. Anja Lee Wittels, our head chef, founder and owner of Anja Lee Catering, didn’t need to wait to grow up to get started on her dreams. As a young girl, Anja always had an interest in cooking. When she was about 10, she recalls her mom letting her cook dinner for the first time. “I jumped right in and cooked a meal for my whole family! The feeling of everyone being together at the dinner table around something I created brought me the greatest joy.” That interest in cooking didn’t wane and as Anja grew, her passion for the culinary arts continued. At only 13, Anja asked to join a local catering company and help them with events. She ended up working with the company all through high school, the experience leaving her with an ever-growing passion for cooking. That interest in cooking didn’t wane and as Anja grew, her passion for the culinary arts continued. At only 13, Anja asked to join a local catering company and help them with events. She ended up working with the company all through high school, the experience leaving her with an ever-growing passion for cooking. As her cooking expertise and enthusiasm continued, Anja started to pay more attention to the kind of food she was making and eating. Developing a few food allergies made her realize the importance of knowing where your food comes from and the ingredients they contain. An education centered on food was the next step in her journey. She created her own major “The Political Economy of Food” at UC Berkeley and studied abroad for over a year in the gastronomic capital of the world: Lyon, France. “While there, I worked in many different restaurants as a “stagière” to learn how to cook French food well. My favorite moments, however, were cooking at home in the kitchen with my French host mother Sylvie,” Anja remembers. After graduation, Anja worked as a personal chef and even pivoted to software sales for a bit before returning to what she knew best: food! 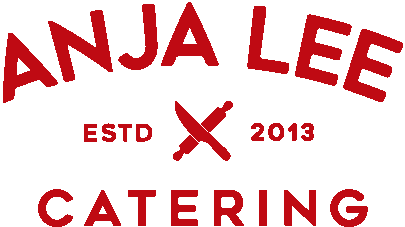 She founded Anja Lee Catering in 2013 and hasn’t looked back since. Anja is passionate about making the kind of food that she would eat herself! She is focused on creating healthy, delicious cuisine without processed sugars, canola oil, wheat and other foods that tend to irritate our bodies. That enjoyment in the kitchen she first felt at the tender age of 10 has blossomed into a passion for crafting fine food for every day.